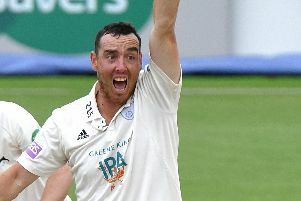 Kyle Abbott claimed a hat-trick as Hampshire closed in on victory in the County Championship relegation battle with Worcestershire after 24 wickets fell on the second day at Blackfinch New Road. The home side were set a 248 target on a bowler-friendly wicket and had collapsed to 120 for eight by the close in their second innings. An extra half hour was taken but Worcestershire hung on to extend the game into a third day after bad light had the final say. Abott had Joe Clarke (33) caught behind, bowled night-watchman Josh Tongue (0) and trapped Ed Barnard lbw (0) to complete his treble – the final three dismissals of an action-packed day. The 31-year-old was the first Hampshire player to claim a hat-trick since Billy Taylor in 2006 and had figures of five wickets for 35 runs from 10 overs. 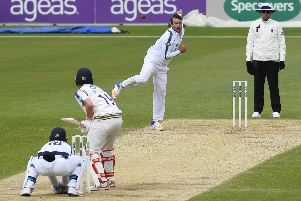 Abbot’s efforts put the icing on excellent bowling throughout the day from himself, Dale Steyn and Fidel Edwards which led to Worcestershire’s downfall. Worcestershire are now facing a virtually impossible task tomorrow to avoid a second successive setback after Lancashire pulled off an unlikely win against the odds in last week’s meeting at Southport. An indication of the dominance of ball over bat is that only one half century has been scored so far in the game by Hampshire keeper Tom Alsop in his side’s second innings. Worcestershire resumed on 68 for four in their first innings in the morning and were bowled out for 120 in just 16.2 more overs. When Hampshire launched their reply Tongue struck in successive overs as debutant Oliver Soames and Joe Weatherley both fell . Dawson (39) and Alsop (64) managed to resist but they got no other support as Hampshire fell to 176 all out . Wickets continued to tumble when Worcestershire began their pursuit of a 248 target with Steyn and Abbott ripping out the top order. Daryl Mitchell departed to a first ball duck – caught at first slip off Abbott – and fellow opener Tom Fell was bowled by Steyn. Alex Milton departed in the same fashion and it soon became 27 for four. Edwards came into the attack and Cox perished before Abbott took his late hat-trick. But Whiteley (37 not out) and Parnell (17 not out) added an unbroken 48.